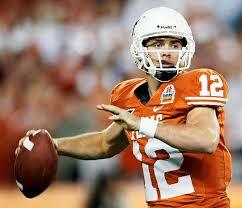 It was supposed to be the greatest moment of Colt McCoy’s college football career. Instead, it turned out to be one of the worst. Heading into the 2010 BCS Championship Game, head coach Nick Saban and top-ranked Alabama were the favorites to win the title over #2 Texas. McCoy would need to have the game of his life for the Longhorns to have a legitimate chance. Unfortunately, after just five plays, any chances of him leading his team to victory were abruptly halted when Alabama defensive lineman Marcell Dareus tackled McCoy on a designed running play. The hit caused the senior quarterback to suffer a pinched nerve in his throwing shoulder. For the rest of the game, McCoy stood helplessly on the sideline as freshman quarterback Garrett Gilbert did his best to keep Texas’ hopes alive. The Longhorns kept the game close early on, but Alabama exploded in the second quarter to take a 24-6 halftime lead. Texas fought back in the second half, but the Crimson Tide defense shut down the late comeback attempt en route to a 37-21 victory and national championship trophy. In its historical context, the verse was part of a larger passage whereas the prophet was communicating a message from God to the kingdom of Judah. It was a dark time in the people’s history. According to the Bible, they were fighting against Babylonian rule as a punishment for turning away from God. Yet there was hope amid the despair, praise in the midst of the lament. Jeremiah was telling the Judahites that they could be saved if they resisted the temptation to rely on man and instead shifted their hearts back to the Lord. For McCoy, ceasing to trust God was never an option. But that verse certainly helped reassure him that everything was going to be okay. And just like in many other moments in his life, the Bible brought McCoy comfort and peace amid one of the most disappointing circumstances of his young life. Dear Lord, we thank You again for the words in the Bible that bring us peace and comfort. Thank You that we can lean on them to get us through the tough times. In the Name of Jesus, Amen.